Android 4.4 (API level 19) introduces the Storage Access Framework (SAF). The SAF makes it simple for users to browse and open documents, images, and other files across all of their preferred document storage providers. A standard, easy-to-use UI lets users browse files and access recents in a consistent way across apps and providers. Cloud or local storage services can participate in this ecosystem by implementing a DocumentsProvider that encapsulates their services. Client apps that need access to a provider's documents can integrate with the SAF with just a few lines of code. Document provider—A content provider that allows a storage service (such as Google Drive) to reveal the files it manages. A document provider is implemented as a subclass of the DocumentsProvider class. The document-provider schema is based on a traditional file hierarchy, though how your document provider physically stores data is up to you. The Android platform includes several built-in document providers, such as Downloads, Images, and Videos. Client app—A custom app that invokes the ACTION_OPEN_DOCUMENT and/or ACTION_CREATE_DOCUMENT intent and receives the files returned by document providers. Picker—A system UI that lets users access documents from all document providers that satisfy the client app's search criteria. Lets users browse content from all document providers, not just a single app. Makes it possible for your app to have long term, persistent access to documents owned by a document provider. Through this access users can add, edit, save, and delete files on the provider. Supports multiple user accounts and transient roots such as USB storage providers, which only appear if the drive is plugged in. Figure 1. Document provider data model. A Root points to a single Document, which then starts the fan-out of the entire tree. Each document provider reports one or more 'roots', which are starting points into exploring a tree of documents. Each root has a unique COLUMN_ROOT_ID, and it points to a document (a directory) representing the contents under that root. Roots are dynamic by design to support use cases like multiple accounts, transient USB storage devices, or user login/logout. Under each root is a single document. That document points to 1 to N documents, each of which in turn can point to 1 to N documents. Each storage backend surfaces individual files and directories by referencing them with a unique COLUMN_DOCUMENT_ID. Document IDs must be unique and not change once issued, since they are used for persistent URI grants across device reboots. Documents can be either an openable file (with a specific MIME type), or a directory containing additional documents (with the MIME_TYPE_DIR MIME type). Each document can have different capabilities, as described by COLUMN_FLAGS. For example, FLAG_SUPPORTS_WRITE, FLAG_SUPPORTS_DELETE, and FLAG_SUPPORTS_THUMBNAIL. The same COLUMN_DOCUMENT_ID can be included in multiple directories. As stated above, the document provider data model is based on a traditional file hierarchy. However, you can physically store your data however you like, as long as you can access it by using DocumentsProvider API. For example, you could use tag-based cloud storage for your data. In the SAF, providers and clients don't interact directly. A client requests permission to interact with files (that is, to read, edit, create, or delete files). The interaction starts when an application (in this example, a photo app) fires the intent ACTION_OPEN_DOCUMENT or ACTION_CREATE_DOCUMENT. The intent can include filters to further refine the criteria—for example, "give me all openable files that have the 'image' MIME type." Once the intent fires, the system picker goes to each registered provider and shows the user the matching content roots. The picker gives users a standard interface for accessing documents, even though the underlying document providers may be very different. 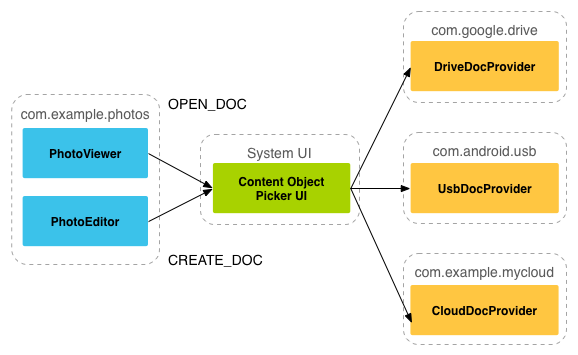 For example, figure 2 shows a Google Drive provider, a USB provider, and a cloud provider. Figure 3 shows a picker in which a user searching for images has selected a Google Drive account. It also shows all of the roots available to the client app. When the user selects Google Drive the images are displayed as shown in figure 4. From that point on, the user can interact with them in the ways supported by the provider and client app. On Android 4.3 and lower, if you want your app to retrieve a file from another app, it must invoke an intent such as ACTION_PICK or ACTION_GET_CONTENT. The user must then select a single app from which to pick a file and the selected app must provide a user interface for the user to browse and pick from the available files. On Android 4.4 and higher, you have the additional option of using the ACTION_OPEN_DOCUMENT intent, which displays a system-controlled picker UI controlled that allows the user to browse all files that other apps have made available. From this single UI, the user can pick a file from any of the supported apps. Use ACTION_GET_CONTENT if you want your app to simply read/import data. With this approach, the app imports a copy of the data, such as an image file. Use ACTION_OPEN_DOCUMENT if you want your app to have long term, persistent access to documents owned by a document provider. An example would be a photo-editing app that lets users edit images stored in a document provider. This section describes how to write client apps based on the ACTION_OPEN_DOCUMENT and ACTION_CREATE_DOCUMENT intents. When the app fires the ACTION_OPEN_DOCUMENT intent, it launches a picker that displays all matching document providers. Adding the category CATEGORY_OPENABLE to the intent filters the results to display only documents that can be opened, such as image files. The statement intent.setType("image/*") further filters to display only documents that have the image MIME data type. Once you have the URI for a document, you can open it or do whatever else you want to do with it. Note that you should not do this operation on the UI thread. Do it in the background, using AsyncTask. Once you open the bitmap, you can display it in an ImageView. After you create a new document you can get its URI in onActivityResult() so that you can continue to write to it. When your app opens a file for reading or writing, the system gives your app a URI permission grant for that file, which lasts until the user's device restarts. But suppose your app is an image-editing app, and you want users to be able to access the last 5 images they edited, directly from your app. If the user's device has restarted, you'd have to send the user back to the system picker to find the files, which is obviously not ideal. There is one final step. The most recent URIs that your app accessed may no longer be valid—another app may have deleted or modified a document. Thus, you should always call getContentResolver().takePersistableUriPermission() to check for the freshest data. Android 7.0 adds the concept of virtual files to the Storage Access Framework. Even though virtual files do not have a binary representation, your client app can open their contents by coercing them into a different file type or by viewing those files by using an ACTION_VIEW intent. To open virtual files, your client app needs to include special logic to handle them. If you want to get a byte representation of the file—to preview the file, for example—you need to request for an alternate MIME type from the documents provider. To get a URI for a virtual document in your app, first you create an Intent to open the file picker UI, like the code shown previously in Seach for documents. Important: Since an app cannot directly open a virtual file by using the openInputStream() method, your app does not receive any virtual files if you include the CATEGORY_OPENABLE category in the ACTION_OPEN_DOCUMENT intent. After the user makes a selection, the system calls the onActivityResult() method, as shown previously in Process results. Your app can retrieve the URI of the file and then determine whether the file is virtual using a method similar to the following code snippet. After you verify that the file is virtual, you can then coerce the file into an alternative MIME type such as an image file. The following code snippet shows how to check whether a virtual file can be represented as an image, and if so, gets an input stream from the virtual file. For more information about virtual files and how to handle them in your Storage Access Framework client app, watch the video Virtual files in the storage access framework.